I had the opportunity of experiencing my first New Orlean’s Mardi Gras this last week. I went to visit my brother, his wife, and their beautiful new baby girl. Prior to the actual parades we went shopping and found a multitude of gear that ‘needed’ to be purchased for the occasion. During our trip around town we spotted a shirt with the slogan, “Keep Calm and Parade On”. And it was at that very moment the slogan for our upcoming holiday was decided. Now, this wasn’t just my first Mardi Gras, this was also my first glimpse into what makes up this Southern holiday. Up until this week I had no idea what was all included in the cities age old traditions behind these parades, which make up the two weeks prior to Mardi Gras Tuesday. All I ever knew of Mardi Gras was the typical depiction of Bourbon Street on Fat Tuesday. I was surprised to find out this holiday is actually a family centered party. There were drinks, of course, but what is a parade without drinks? The people lining the streets waiting to watch the marching bands and floats pass by were older NOLA folk watching these parades for the umpteenth time, families with children on ladders poised and ready to catch arm loads of beads, and young couples spending the day people watching and enjoying the atmosphere. So it was at my first parade I noticed a similarity between people from NOLA and people from Minnesota – it was one of the few similarities in tradition and culture I saw, so it sparked my interest almost immediately. So here we were, Evelyn and I, lined up along a city street with mothers and children on both sides of me. I was sporting my slogan slashed t-shirt, as I caught a glimpse of the first float heading our way. From blocks away you can see the ‘throws’ (as they are called) being tossed way into the air, landing in the hands of the screaming children in the street below. Beads of all sorts of colors, stuffed animals, toys, and more. As the float inched closer I, along with every mother around me, began to tense just a little. Our children standing down at our feet are wearing huge smiles and bouncing around from the sugar high, induced by all the traditional King Cake they had been eating all week. The float now starts to pass in front of us and as the children stretch, reach, and scream the mothers all stiffen in defense mode. Each mother protecting their children’s prized possessions from other children and mothers. Each mother widening their stance, just slightly, with each passing second as to give their child a better chance to catch the best throw. Each mother glancing quickly over the ground around them so as to not miss their chance at grabbing just one more trinket for their child. I could have just as well been at the Halloween Parade in my hometown of Anoka, MN – reaching around on the pavement for just one more piece of Dubble Bubble; scrambling, as if it was Evelyn’s last chance in the world to taste that sweet bubble gum. The more parades I went to the more our slogan started to strike me as fitting, not just for Mardi Gras, but for everyday life. As a mother, I want so deeply for my children to have so many different things and I’m striving to help them achieve these things, far too often simultaneously. I want them to be safe, so I widen my stance everywhere we go, in hopes that I won’t need to see them get hurt. I want them to have the best there is to offer in this world, so I harden – ever so slightly – in order to ensure they end up with the best. I want them to have joy, so I do what I need to do to make sure they are happy, even if it is at my own expense. I praise them when they get a ‘throw’, I give them mine when they don’t, and when there is no catch I reassure them that the necklaces the boy standing in front of us caught were actually meant for them and we’ll get more the next time around. I don’t think any of this is wrong … well, as women we could certainly take a step back and allow our children to handle parade ‘throw’ gathering to themselves. What I mean is I don’t think it is wrong to do everything in our power to help our children achieve their worth. To make sure that they have the best chance, the best opportunity, and the best possible outcome …. either when watching a parade or in other – more important – life events. What I liked though, was the slogan. Most likely, the children will forget within seconds what was caught and what was missed on that float. Within days, possibly even hours, the luster of the cheaply made toys will dull and they will move on to the next thing. It is the mother’s heart that remains tied so tightly to the emotion invoked by the event. In part, it has to do with motherly instincts, and there is no better God-given gift in the world. We do what we need to do for our children … and without that motherly love I imagine the Earth would look like a far emptier place. We should, however, remember our own hearts. I should try to remember that I have a heart of a mother, but I am also very much a daughter of God, as well. We don’t need to stop listening or acting on our motherly instincts to protect and work hard for our children, but I think we could take some advice from the shirt. I know my anxieties tip on the heavier end of the scale, but I imagine I would be a much better mother – a much better Christian – if I was able to put these words into action on a daily basis. I find that I act in ways I wouldn’t in order to protect my child, but we are called to remain humble. We are called to give it to God in prayer. We are called to be slow to speak and slow to anger. This slogan works for me when I think of times I am alone with my children teaching them how to grow in grace or how to live life on this Earth. This slogan works for when I think of attending Kindergarten registration or planning the perfect birthday party. This slogan works when I am having a playdate and my child is the one who refuses to share. So just maybe … the next time I’m faced with anxieties of parenthood, or those inevitable moments when innocence collides with real life, or when taking on the exhausting task of daily discipline … I can remember to remain in Christ’s peace. I can remind myself to move forward from that moment and onto the next. I can assure myself the importance of the simple words …. 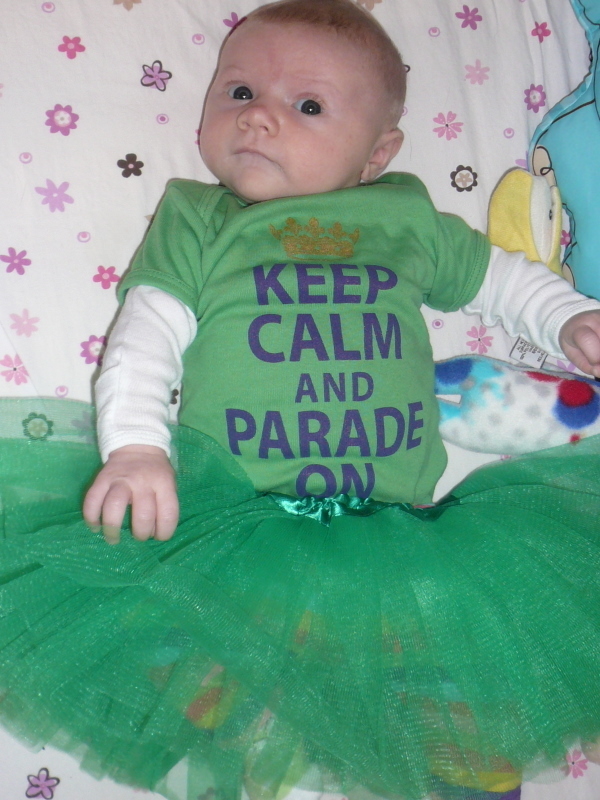 Keep Calm and Parade On.